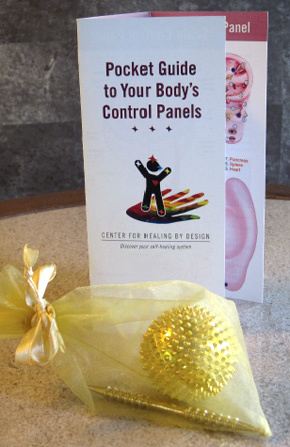 Center for Healing By Design, Inc.
At CENTER FOR HEALING BY DESIGN, we provide customized acupuncture treatment sessions (with or without needles!) that honor your individuality and your unique needs. We draw from holistic principles so that you can re-balance and revitalize yourself physically, mentally, emotionally and spiritually. But that is just the beginning. We also provide tools and services that help you build your own ability to accelerate healing, reach your optimal health and maintain it for many years to come. Are you aware that you have the ability to relieve pain and discomfort, revitalize your energy, improve your sleep, and boost your immune system — within minutes — right at your fingertips? Part of the magnificent design of our bodies is to heal and to provide us with the means to stimulate and accelerate that healing. It’s like we each have our own self-care kit built right in to us, going every where we go. Experience gentle yet powerful acupuncture sessions with licensed acupuncturist and auricular medicine specialist, Lisa K.Y. Wong, L.Ac. Lisa’s approach is informed by a profound passion to help people heal that has blossomed from a very young age. Her Whole Body Exam and Tune-up Treatment will get your systems primed and optimized! But more than that, Lisa will teach you self-care methods that you can easily integrate into your day-to-day routine, that will make a world of difference to your health! Having experienced the traumas of needles when she was sick with a kidney infection as a child, Lisa has developed a unique set of methods to deliver all of the power of acupuncture without the use of needles. If needles are a problem for you (or even if they’re not!) we invite you to schedule a needless-session with Lisa. 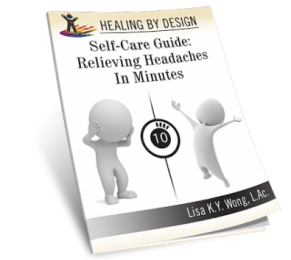 After years of clinical experience in private practice, on staff at Kaiser Permanente San Jose Medical Center, and as a community volunteer, Lisa developed the Healing By Design Method™ to unlock the powerful healing capability of the human body. Based on principles of ancient Asian medicine combined with advances in western medicine, the Healing By Design Method™ gives you easy tools to speed up your natural, innate healing processes with amazing, often immediate, results. It includes our proprietary 3-step process that deepens healing and accelerates repair and recovery. Once you start using the Healing By Design Method™, you’ll see your body differently and appreciate the exquisite design of your body more than you ever thought possible. Our Self-Care AcuPak™ includes fun, easy and mobile tools to ease pain, improve circulation, strengthen organs, and help you feel healthier and stronger in a matter of minutes. Since the body provides clues to our ills in the form of trigger points or Healing Buttons™ that have been taught for centuries, we can use modern methods to simply and easily provide ourselves with profound self-care, any time, anywhere. Offered at our Center as well as various hospitals and corporate and school settings in the form of live workshops and online webinars, these classes give you an in-depth yet broad training in the Healing By Design Method™. Learn how to use them to improve the health of numerous systems of your body as well as learn how treat specific health conditions. Contact our Center if you would like to have a self-care class given at your work place, church or school. It is our mission to empower you with self-care resources so you can take care of your body, heal what ails you, and live a long, healthy life. Take charge of your own health and learn the art of self-care that is easy yet profoundly valuable. Imagine how much better you can feel, how much more enjoyable and productive your life can be, and how much money you can save on pain medications if you are able to treat yourself any time, anywhere. You can also teach it to your friends and family, so they can benefit from it too. At the early age of 7, Lisa contracted a kidney infection and was confined to a hospital in China for a month. While she was there, the nurses poked her arms with large IV needles several times a day — and she developed a fear of needles! But the experience had an ‘up’ side: Lisa’s compassion bloomed. She felt for all those people rendered powerless by illness and suffering from intense pain caused by treatments that were supposed to help cure. Her deep urge to help people and help them relieve their pain and suffering drew her to make a difference in healthcare. Ironically, after a successful turn as a software engineer, she turned to acupuncture and became a licensed practitioner. While she conquered her fear of needles during her training, she can still relate to the fear of needles that many people have — even though acupuncture needles are dramatically thinner than hypodermic needles. Even so, a central goal of her research has been to find alternatives to the use of needles. After studying alternative modalities such as reflexology, Lisa developed the Healing By Design Method™, an effective 3-Step process to do acupuncture without needles! 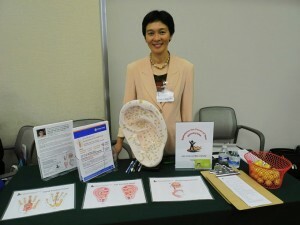 Now, anyone can now enjoy the benefits of acupuncture any time, anywhere.